Next month my handsome husband and I will celebrate our one year wedding anniversary. While my parents say that it feels far longer, I can’t believe that it has already been a year. It’s been a busy 12 months to say the least, but looking at the gorgeous photos from our big day still give me goose bumps. Some of my favorite photos are from the afternoon leading up to the ceremony. Brock and I both had separate suites at the Bryant Park Hotel. Brock and his guys spent the day playing basketball and grabbing lunch while my sister, bridesmaid and I had some food, got our hair done, and did our make up in a beautiful room with flutes of champagne. We decided not to see each other at all the day of our wedding until the ceremony. The chills and nerves of the day were absolutely worth that incredible moment. My sister helped play make up artist for the day. We switched back and forth between mirrors with some country music playing and Kelsey calmly humming around taking photos. I love to think about Brock getting ready with his friends at the same time I was trying to swallow my nerves and excitement. While I took a peek at the venue out of the window, I made sure to stay away the moments before the ceremony. I didn’t want to see him walking across the street! Before I even realized what time it was, Kelsey suggested we put on the dress! Right about this time my brother knocked on the door with a band aid for my sister, great timing! Seeing my parents and brother for the first time dressed was when everything became beautifully clear and real. It was an overwhelming time of joy before we all hopped in the elevator to walk across 40th street and get married. 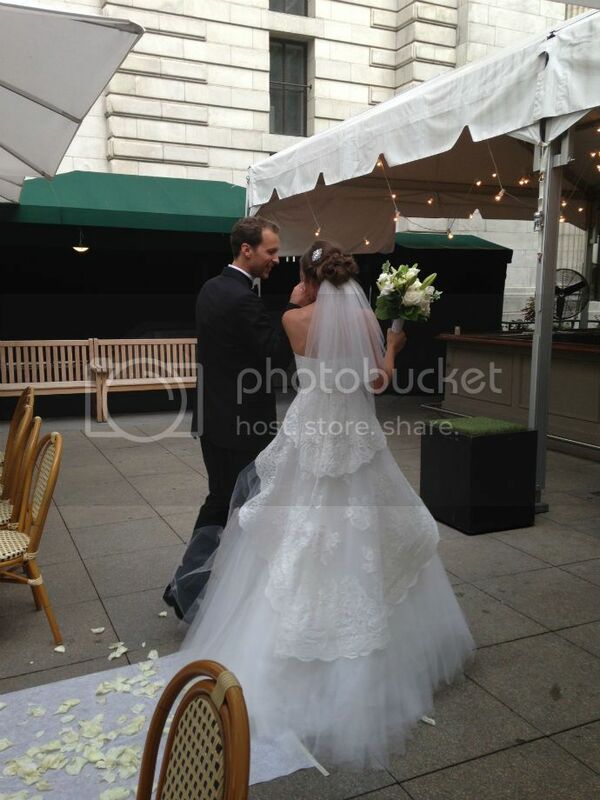 Three weeks ago today the boy and I were married in the center of New York City on the most beautiful day imaginable. The entire weekend was more than we ever could have hoped for, and the actual wedding day is a blur of smiles, laughter, and crystal clear moments of intense happiness. The following day we left for a perfectly relaxing, adventurous and incredibly fun honeymoon in Europe. What an incredible ride! Now as we attempt to stash wedding gifts in our quite full apartment, I’m waiting on pins and needles for the photos from Kelsey! One of the things that has been secretly (or no so secretly depending who you ask) stressing me out is my wedding hair. I like to think of myself as fairly low maintenance. I can literally be shower to date night ready (with hair washing!) in 40 minutes. So it seemed ridiculous that I was getting stressed out over hair. But was.I.ever. Finally I bit the bullet and hired a stylist for a trial. Holy disaster. My nightmare hair is perfectly parted, stiff, and even slightly matronly. We managed all of this and more in our two hour period. It kept getting worse as I kept pulling up the photos I sent pre-appointment and asked for more wave, less shallacked curl. If you never wear your hair up (or vice versa) it can be strange to see a style on yourself. But I didn’t need time to realize this was not going to work. Two hours later I was traumatized and back to square one. This week, realizing I needed to try again, I emailed the team at Bloom Beauty Lounge. Their slogan of, “Don’t want to feel like you’re attending a 1985 prom on your wedding day? Here, you will get a romantic, perfect-for-you updo and makeup for your special day” had me confident that we could be speaking the same language. Thankfully Tara totally got me today! We tried what I originally thought would work and when I looked less than thrilled she explained what no one else had said (and what makes total sense!) As you are pinning like a mad woman, most photos show the back or side of the updo. So when you see the front on yourself, let’s say it’s a little wah wah. She also emphasized that I have a lot of hair. (I do know this, but easily forget it.) Obviously styles on shoulder length hair change quite a bit on mid back length hair. Oh the woos of Pinterest. Instead she happily took out the front and reworked it with different parts, twists, curls, braids, and lift. She took several photos with different angles, and then gave me her direct email so I could contact her with any adjustments, questions, and photos. Of course as I got home I had a few tweaks and questions, but feel such a sense of relief. Even if it was a slightly embarrassing way to begin. Oh and that sweet fishtail braid? Tara did it in two minutes after taking out all of my bobby pins. I think I would wear this four days a week… if I could do it to myself.